Are you feeling a bit stuck and insecure about where your life is going right now? Are you looking for answers to why you keep replaying the same patterns in your life, and things never really change or improve? Is there a part of you that knows you “should” be doing something to take care of yourself and your energy, but you aren’t sure where to start? If you answered ‘YES’ to one or more of these questions, Ashley’s workshop is for you. Think of Kundalini Yoga as the yoga of energy. If you've never tried it, it's unlike any other style of yoga! It consists of exercises called "kriyas," which are meditations and breathing exercises that help you achieve certain outcomes. 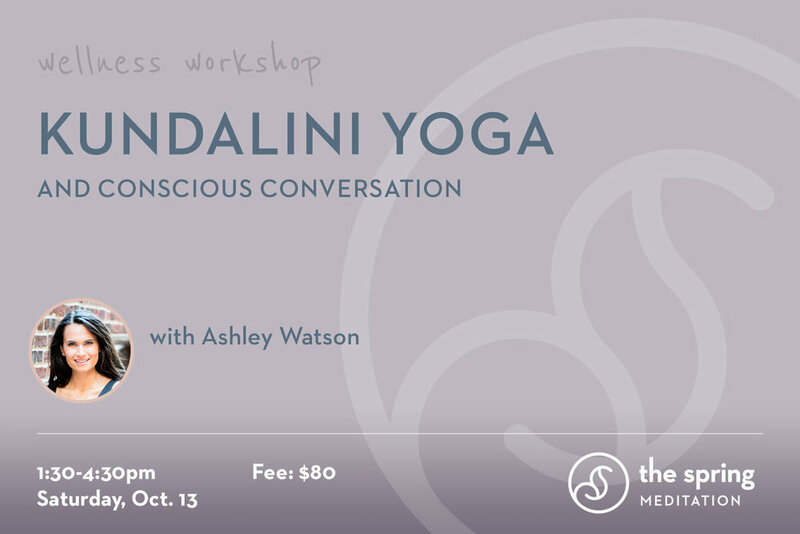 Kundalini Yoga works with your nervous system to challenge and shift you into aligning with your highest self. In Kundalini yoga you may laugh, cry, get angry and/or feel super blissed out in just one class. It’s pretty incredible! In a world where we are so connected through technology and simultaneously disconnected from each other, the Conscious Conversations component of the workshop allows you to connect with your innermost desires as well as other non-judgmental people who will support you. Ashley creates a safe, loving space for her groups where you can speak freely about what has been going on for you and get the support and answers you need. All are welcome, no yoga or meditation experience required.